I have'nt done much group photos before feel free to give me your opinions on how it can be better. How is the composition, lighting, how the group is posed, location etc. The weather was not brilliant that day quite a lot of clouds. Bit of a challenge to ask them to pose because not everyone can fit in safely the guy on far right is close to where cars come by. I think it may not have been a bad idea to put them in the middle of the street if there was a lull in traffic. You can't help the height of the guys and gals, but their posing makes the image seem quite unbalanced, as does having the one guy to the left. I think putting the shortest guy next to the girls would have helped. I also think the arrangement can be better. Sure, males and females in this shot bring a sense of imbalance. Also, the car is redundant. Whenever you have a problem, just sing your favourite song! You will realize that your voice is far worse than your problem! Wow ..... Its a great shot. 1. the car - shame it's there - would have been better to loose it altogether. 2. The lighting towards the end of the street needs to be toned down to balance the photo. 3. 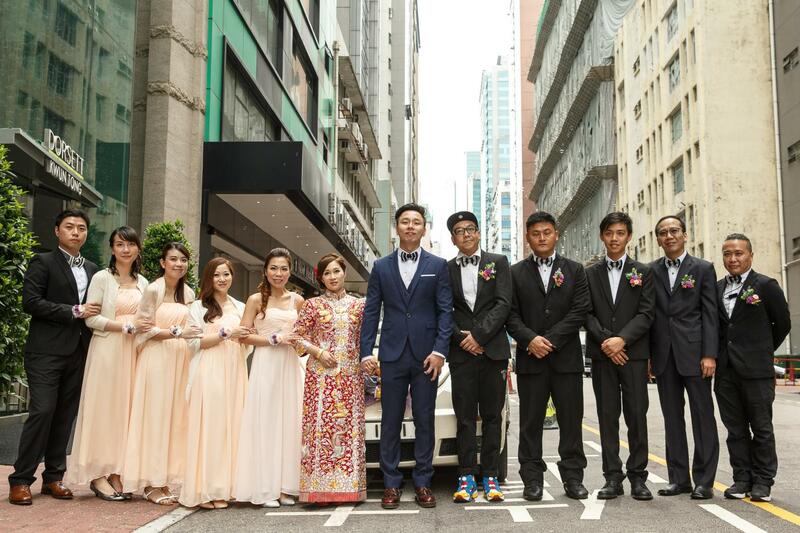 I feel that the photo is too flat - if the people had been put into a V so that the bride and groom stood forward of the rest would have added depth to the photo. 4. I can see what you tried to do with the layering of the height of the people but it just doesn't work for me and the V formation might have helped with this. 5. the shoes of the best man - colour them black with photoshop - it just throws it and draws the attention to the car. 6. did you try and have boy girl boy... Might have been better. 7. too much of the buildings which detract from the people who are the main aspect of the photo. These are my opinions of course so feel free to disregard.